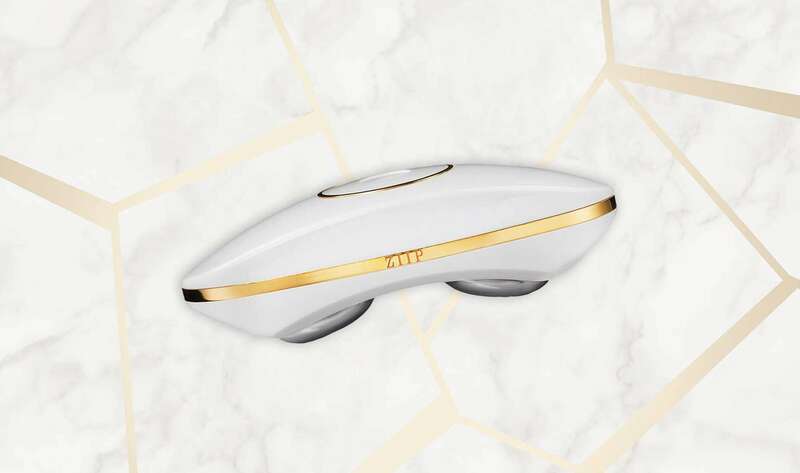 Is the Ziip Beauty Nano Current Skincare Device Really Worth All That Money? Everyone has gotta agree with me on this, no one likes wasting their hard earned money on a rubbish product. When I saw the Ziip Beauty Nano Current Skincare Device, my first thoughts were, my gosh- that’s a lot of money. If this product doesn’t work, that’s a huge waste. So lets find out what it does and if it really does what it claims to do! What is the Nano Current Skincare Device? Before buying a product I’m sure you like to know exactly what it does. Especially when it has a price tag of £425/$495! Honestly, it was a slight struggle getting to the bottom of what the nano current does and how it achieves what it claims to achieve. However, I’m not one to give up, (at least I try not to!) so after a ton of researching nano currents I think I finally understand! 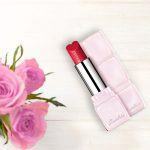 What does Ziip Beauty claim the device does? The results you should see after using the Nano Current device is that your face should be energised. It should improve the firmness in your face and improve any lines and folds. It should also reduce dark circles under the eyes. Another result you should see is that your blemishes should clear up with the inflammation decreasing immediately after using the device. After 12 hours the blemishes should be at least 75% better. Pretty big claims, huh?! The Nano Current Skincare Device sends small electric currents to your face. The currents stimulate a natural chemical in our skin called Adenosine Triphosphate (ATP). ATP is basically like a battery in your skin that releases energy. As we get older our bodies aren’t as great at producing and storing ATP. That’s where Nano currents come in. They increase the level of ATP in your body. The Ziip device works in a pretty unique way. It looks like some futuristic computer mouse with a built in bluetooth which you connect to the Ziip Beauty app. With recommendations from your phone you can then select the setting of your choice. It comes with 7 different functions which they call electrical cocktails. 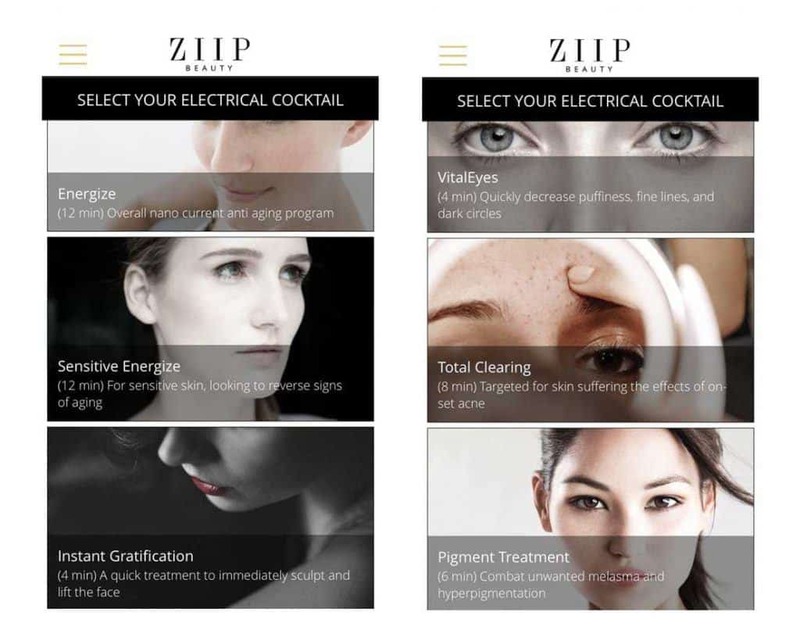 The different cocktails you can chose from are Energize, Sensitive Energize, Instant Gratification, Vital Eyes, Total Clearing, Pigment Treatment and a Men’s Treatment. Below you can see what each setting does. You can also use more than one setting to get astounding results! What’s in the box and how to use? The device comes in a beautiful box which looks and feels expensive. The box comes with a Ziip device, an 80ml bottle of Golden Gel, a charger with a USB cable and wall adaptor, a travel bag, a cleaning cloth, user guide and illustrated instructions. To use the device, download the app from iTunes and choose the treatment that you want. Once both the Ziip and the bluetooth are enabled, the treatment will get sent to your device. You’ll see the device will start flashing and a tick will appear once the treatment has been sent. 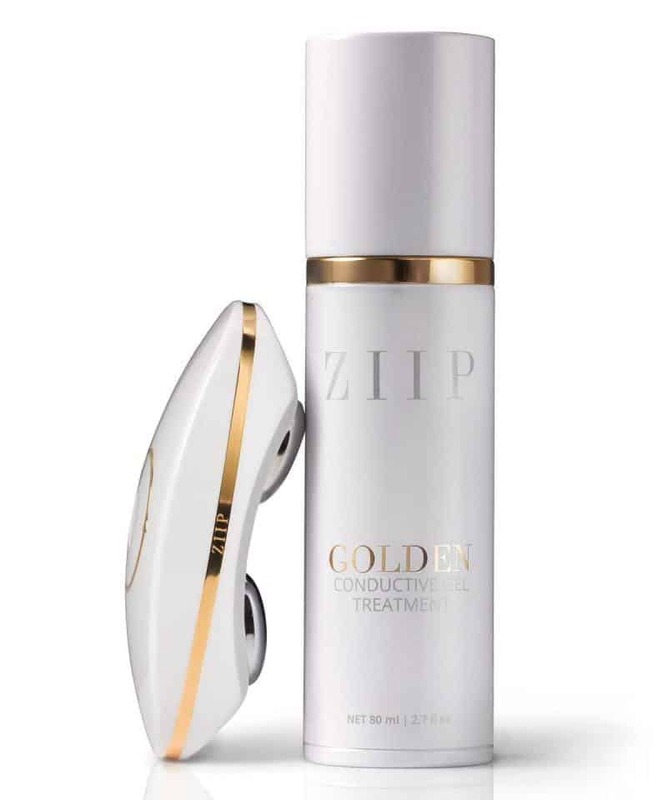 Before using the Nano current apply the Ziip Beauty Golden Conductive Gel Treatment that comes with the gel. It feels a bit like the gel in an ultrasound. Yes I know I’m a tad one track minded at the moment. I am pregnant after all! The gel isn’t just to help the device work, its also extremely hydrating and has anti inflammatory and anti ageing effects. My criticism is that the Ziip Beauty website should be far more informative than it is. They are trying to sell a high end expensive product with very little information on how exactly it works and what to expect when using the device. Everything seems a little secretive. Another thing that bothers me is that the padded travel bag could be a little nicer, for the price you pay for the device, a high-end travel bag shouldn’t be too much to ask for. It does look kinda cheap. Another minor issue is that the device is only iPhone and iPad compatible. No android yet, but hopefully it’s in the making. Do you own the Ziip Beauty Nano Current Device? If yes, what has your experience been like? I’d love to hear from you in the comments below! Wow! That price tag is steep! But it really is much cheaper than getting professional treatments. So I guess it isn’t too bad. 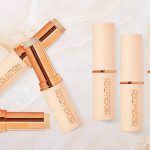 And it does many things that I’m really, really looking for – reduce dark circles, skin firmness, and taking care of my blemishes(I have dark spots from acne). So it would really be awesome to have it. I might just have to start saving up for it 🙂 Should be worth it; especially considering all the rave reviews. I also love how sleek the design looks too. When I initially glanced at the first picture, I thought I was looking at futuristic glasses. I had to look again lol. That’s true- when you add up the amount you spend on professional treatments this does come out a whole lot cheaper! In the long run its truly worth it. Hello and thank you for this informative and thorough article. I really enjoyed reading it. My mothers birthday is coming soon and I want to buy her something special. Ziip Beauty looks like one of products. If only I knew it will really do the job I would have purchased it. But I am having doubts after reading your review. It’s like that with everything- if we always knew the products/clothes/technology that would work best for us we would have the easiest time shopping. But unfortunately, that’s not life! The Ziip Beauty Nano Current Skincare Device is really good and has great reviews. My girlfriends have been trying to get me to come over and use their gadgets and, I think this may be one of them. I’ll come back and let you know if it is. They know I am a meticulous face-ask wearing, facial massage, facial exercise doing type of girl. In my line of work I sit or, stand in front of screens for a long period of time almost daily. I’ll try anything if I feel it’s safe and chemical free. I like the “instant gratification” setting. *giggles* You know we could all use a little of that in our lives! Truthfully, I’ve aged pretty decently thus far. I watch what I put in my body because I know what I put in will manifest in my skin. That said though, I loooove trying new products. Especially products that utilize science over gimmicks! Well done to you for looking after your body well. It’s probably helped you age the way you have! Let me know how you like the Ziip Nano Device! 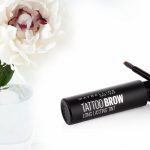 this price tag is a whopper but when i think about it, it’s probably around the same cost I pay for a session on skin treatments and with all the great skincare it covers it might be worth considering as a good purchase. I wonder if the price might come down a tad in the January sales. Do they ship to the UK? I’m sure the prices do come down- check on boxing day for a good offer. All the links on my site are for the UK! That price tag sure is steep, but It is high tech! I have recently noticed bags under my eye’s as well as creases around my eye’s. I see a lot of positive reviews on it so I think it would be worth the price. I’m just curious if there are any side effect’s? I also have some acne that I would like to get rid of. I worry though about long term issues with repetitive use. I have tried things in the past and with some, I have had horrible side effect’s. I also wonder about the possible issues with the additional radiation from the BlueTooth. Although it isn’t much, repetitive use could be harmful? The Ziip device is a professional machine. Its like having your own spa at home. I don’t think you would experience any side effects, nor do I think that using it as per instructions will be harmful. As you mentioned in your post, I wish there were more details about the product and how it works. I’m going to do a little more research, but overall Ziip looks like a really good product and they stand behind it. Thanks for the review and introducing me to this product. If you do learn more about Ziip and the conductive gels I’d love to learn more. Yes, in the long run it is worth it. I am always doing more research on products that I review! Will keep you posted.